drex1999 wrote: Yes!! The first picture in your graft area shows the vellus hairs getting long. That's how it happened for me. 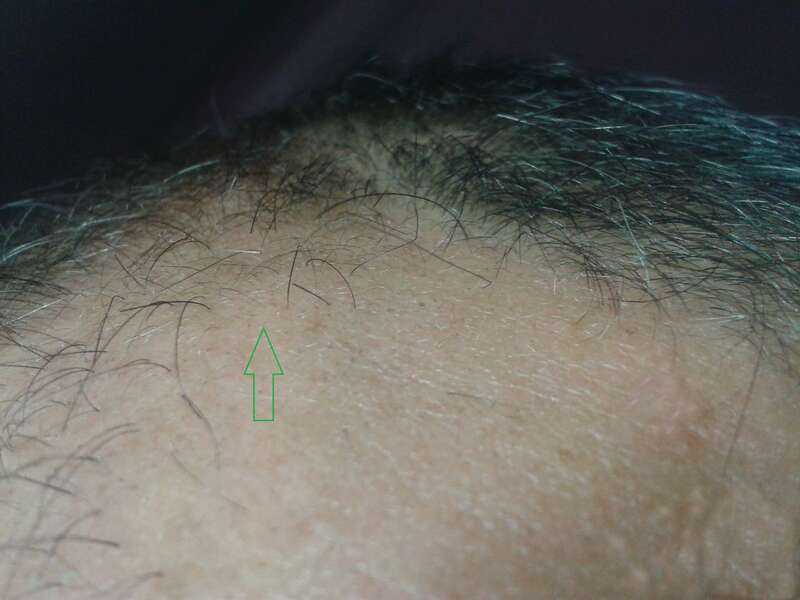 At the 3 month mark, you should see groups of terminal hairs coming in, most likely the best results coming out in patches off your current hairline, although you should see sporadic terminal hairs across the entire area you are working. I always saw the best results happening near the hairline as it began to spread back across the scalp. That is where to watch closest. I will tell you this. What you are doing is working. DO NOT try to improve or improvise on what you are doing. You have it. Now it's just time and perseverance. I posted to the other thread a little while ago on what not to do. How you doing drexx? Any progress since last pics? Hello again, nice to join back with the community and have a few photos to share. I am not sure if Drex has checked back in, but he has been updating on the other thread. Basically he had reported about a 40% regrow, then took a break, saw some loss, and is now giving a fresh try to reclaim and move beyond. Hope that is about accurate. The photos are taken 2 months and a week into treatment. I am traveling again and the lighting is not so good so I only took a few. This light is very direct and does not light up the finer hairs very well. Fortunately it does show the hairs that have thickened and turned black well. Keep in mind that the original receded hairline was behind the regrowth area. 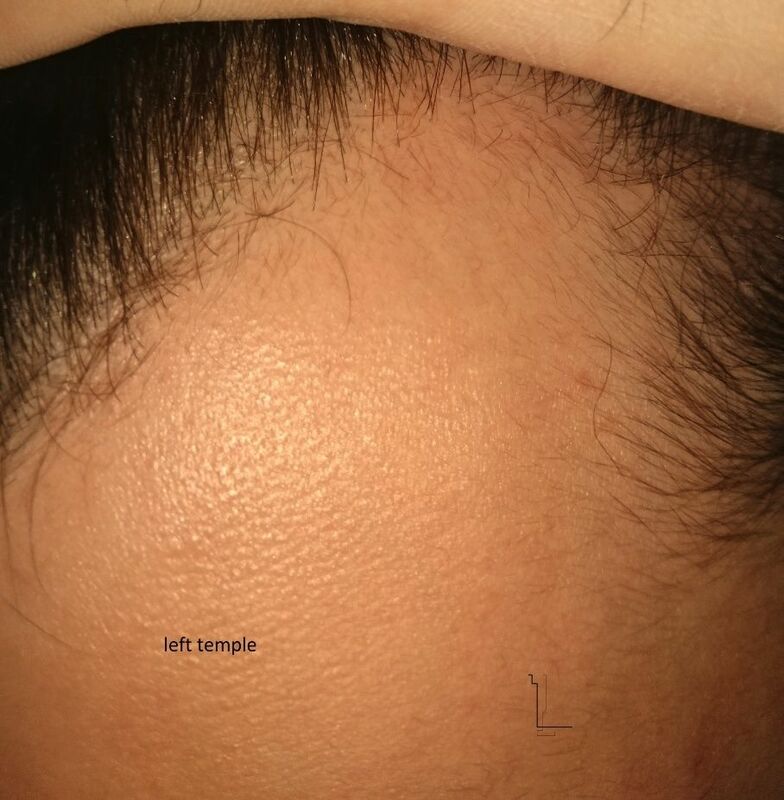 I put my finger in the photos to help with scaling of hair length, and distance from original receded hairline. Of course the new hairs are starting to look developed and just look like a normal thinning hairline. 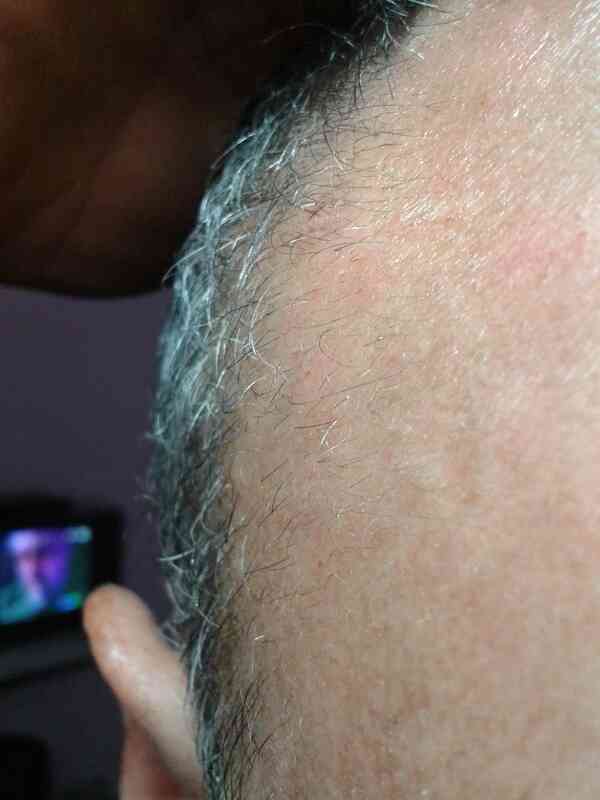 Even looking back at the first post photos, it is pretty clear to me the darkening and thickening of some of the hairs. 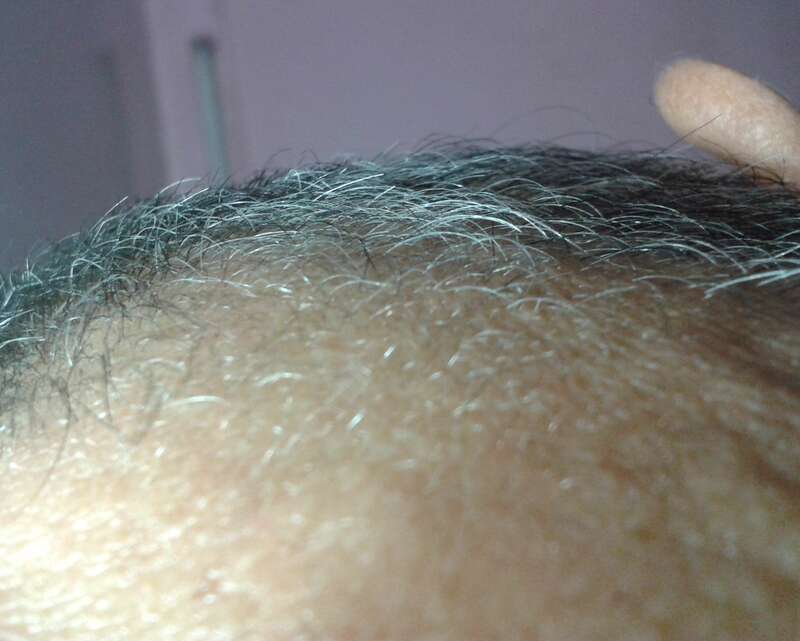 You need to look not just at the distant hairline, but the closer hairs that are not in perfect focus also to see the distances and regrowth. I should mention that I have cut the length of some of the pictured new hairs. They were growing straight out and are full thickness already, so looked out of place too lengthy. 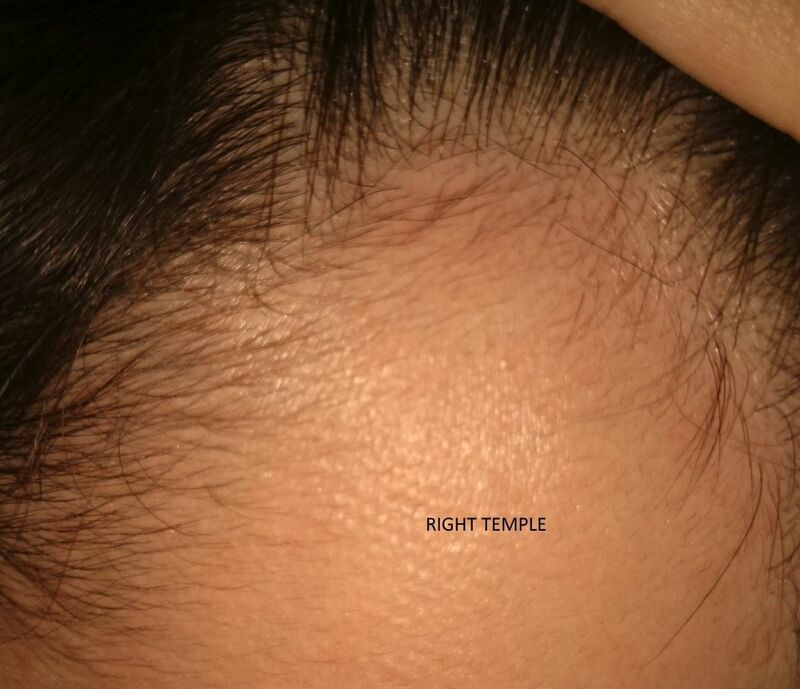 I see other areas of regrowth on the upper scalp, but as you can see, it is hard to separate and distinguish hairs that are near a proceeding hairline. A special thanks to those that have blazed the trail of high pressure treatment like smurfy and sizzling hairs, I moved up to a metal rounded pressing tool this week. Really 90% of the original soreness is gone and the pressure is welcomed. I was concerned when the plastic on my phone charger reacted with the oils and looked like it melted a bit. Never noticed this with the plastic vitamin bottle. I will post a picture of my new tool another time. 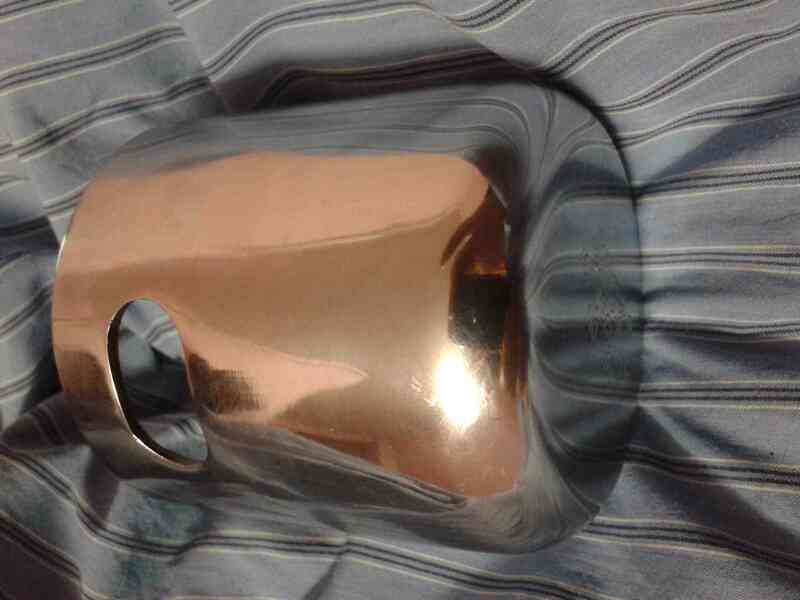 It is basically a metal cup with rounded edges. I wish I had that much hair to work with. Just so others are not confused, those are not photos of me. They are of another regrowth treatment and person. My very early photos are linked in the very first post. Good to see others progress and compare how it looks . Well done photos, for a moment they reminded me of another treatment success photos, I think the juice fasting guy. Feel free to let us know how your soreness progress is, if you are seeing a difference in shed amounts, are you only massaging? I welcome photos here and updates. I can see that your hair is staying healthy and not being damaged by the pressure. cdto2012 wrote: Well done photos, for a moment they reminded me of another treatment success photos, I think the juice fasting guy. Feel free to let us know how your soreness progress is, if you are seeing a difference in shed amounts, are you only massaging? I welcome photos here and updates. I can see that your hair is staying healthy and not being damaged by the pressure. Sounds like an active first month of detox. Glad you took it slower with the chinese massages. If the scalp is not healthy enough, or has a lot of things it wants to purge out, the intense pressure could be too much to start with. Most importantly is to get the blood flowing to repair the tissue for the first month. The bulbs on your shed sound like they could be from friction pulling out hairs . I guess you would notice if you were rubbing the skin or pulling out hairs with the massage. Of course both are to be avoided. As with John Doe, he is also young and has a lot of shed and skin removal, so interested to see how you guys progress. Amazing to see that at such a young healthy age, the scalp can have so many sore spots and want to release oils and dead skin. Anyhow keep us updated, this is the point of sharing, so young guys can find out early and old guys can try again; if there is good results to be had. cdto2012 wrote: Sounds like an active first month of detox. Glad you took it slower with the chinese massages. If the scalp is not healthy enough, or has a lot of things it wants to purge out, the intense pressure could be too much to start with. Most importantly is to get the blood flowing to repair the tissue for the first month. definetely, that regrowed hair color is something interesting. I forgot to mention that what I mean about the white bulb part is that pro-massage shed hair profile is different than pre-massage I'm not %100 sure but I'm pretty sure the shedding profile is different then before so I did some digging and some people who consulted to dermatologist claim that if you see while bulbs at the end of your hair that most likely means that hair was gon fall anyways and will grow back. 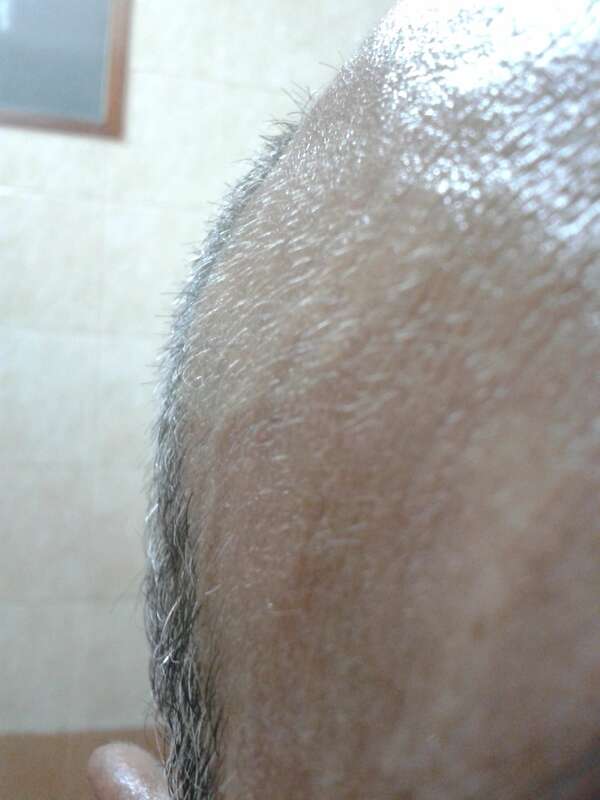 the hairs with grease accumilation seems like the hair is already in telogen phase and grease is holding them there, I also started supplementing k2(menaq7), magnesium, calcium, d3 so now its time to wait and I feel hopeful about this camera can't catch it all but I can feel vellus hairs when I touch my temples. Might as well post this photo with the different light. 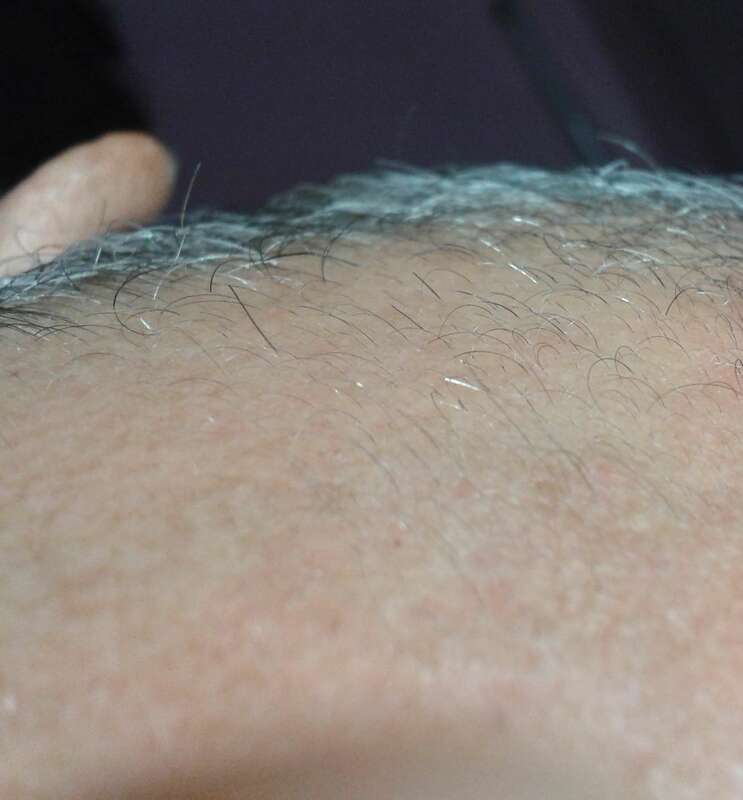 As with the others posted a few days ago, the direct light is mostly showing only the thicker developing hairs (and hiding the thinner remainder - as all were seen in the very first photos). This photo is from the grafts area where the hairline V with the side hairline. If you notice a few dark streaks in the middle, there is a few hairs that have just recently come out full diameter that are not grafts. 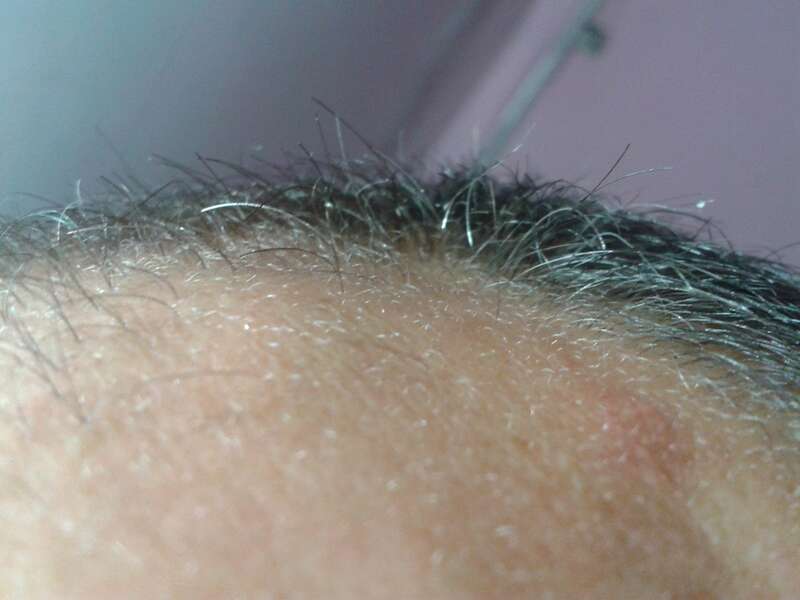 I mostly ignore these anomalies , but I have maybe 10 noticeable hairs like this spread around the scalp. I suppose this is just another photo to show the early gradual thickening process. 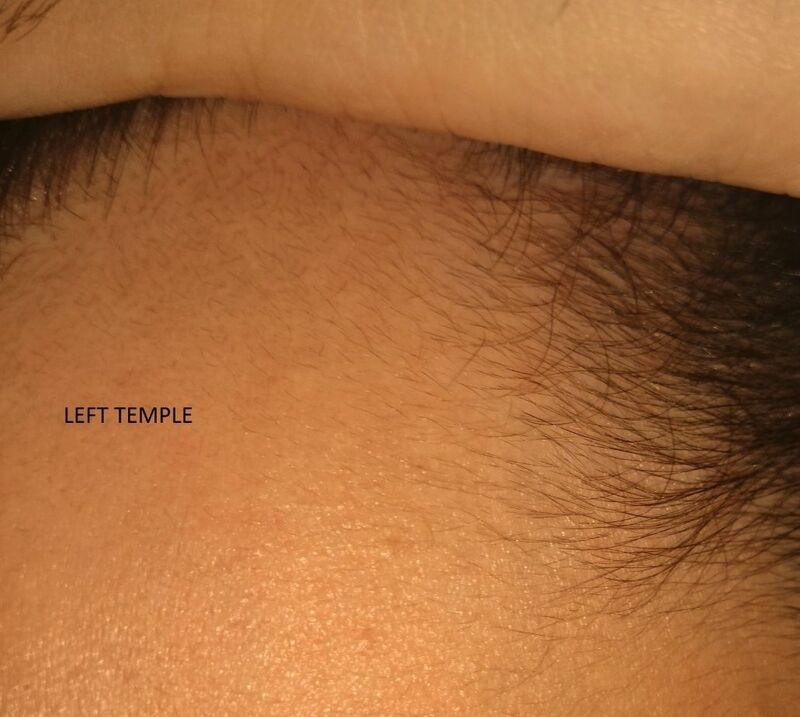 I need to stay consistent with the documentation, as with the temples, once they get growing they soon look like normal hairs. I will add this picture of the metal tool that I use for the pressure massage. It is normally used for covering a door knob to prevent lock tampering. Basically it is like a metal cup. 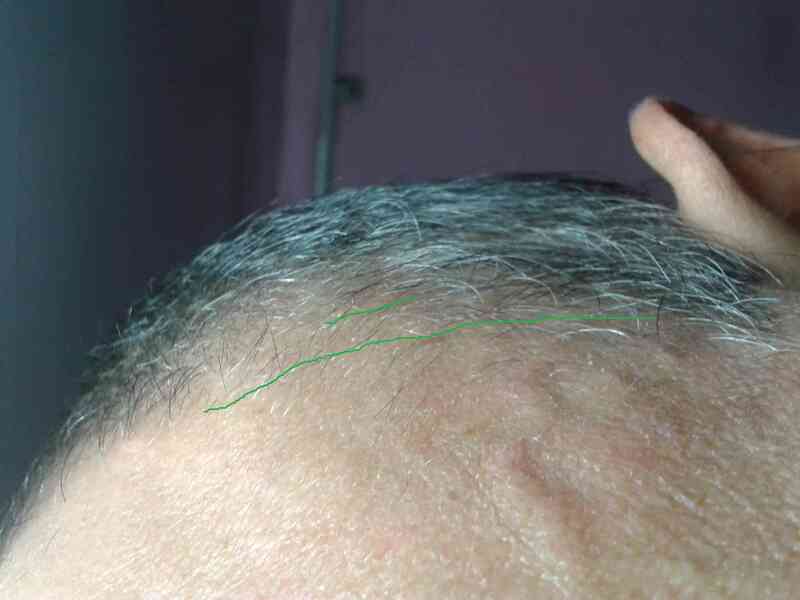 As others have written, the sore spots on the head are normally located in the area of the active hairloss. Also the skin is usually tighter/thicker if gently pinched on the top of the head. Regarding the pain and soreness, as I have said before it is greatly reduced after a few weeks of pressure massage. I wonder if the pain could be like gout in the legs, caused by crystal formation. Perhaps the crystals are calcium or maybe even uric acid deposits under the skin or crystals. Deposits of uric acid (called tophi) that look like lumps under the skin "
I would suppose the cause of this soreness would be well known with all of the research, maybe it is just inflammation. 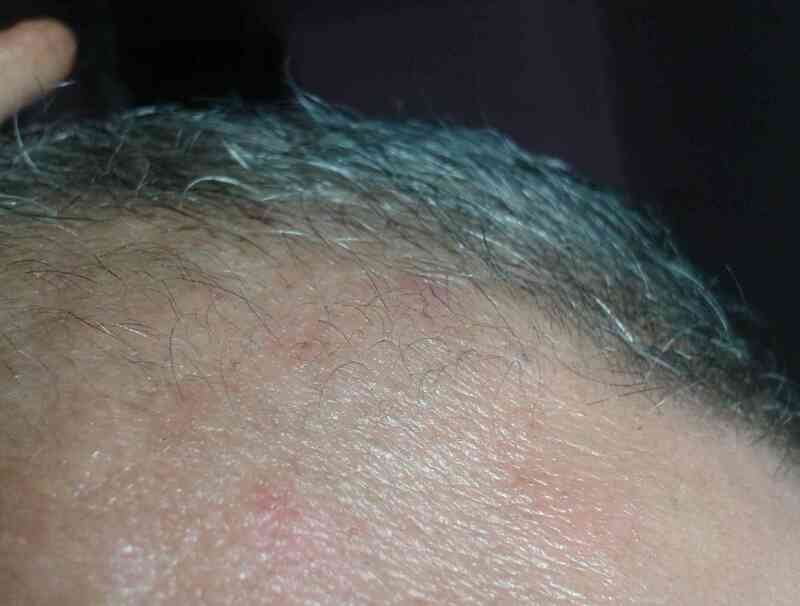 It is interesting that the scalp that is balding usually has the lumpy pad under the skin also. The simple news is that hard pressure massage is able to reduce the pain and seems to be good for regrowth. If people slowly work their way up in pressure, never leaving bruise marks, it seems to be a viable treatment. I still think that 2 handed hard pressure is important for the healing response regeneration to happen. Also to strengthen capillaries and multiple times a day induce active blood flow. I think enough vitamin C is important to keep the tissue elastic and regenerating properly. i wonder what happened to gonzalito ?? did have a full recover??
" Massages for about one year now... Peeling for the last 2 months..."
Even for my own months ago before and now pictures, it is hard to sort out distance to get perspective of what is actual new growth, Having the close up focus makes it hard to get farther back distance comparisons. I do have understanding of people struggling with only pictures of a fuzzy line trying to judge distances. In real life it is quite clear what hairs are new. I saw and posted these temple hairs move from fuzz to slow lengthening, and now many of them are growing as fast as my beard. 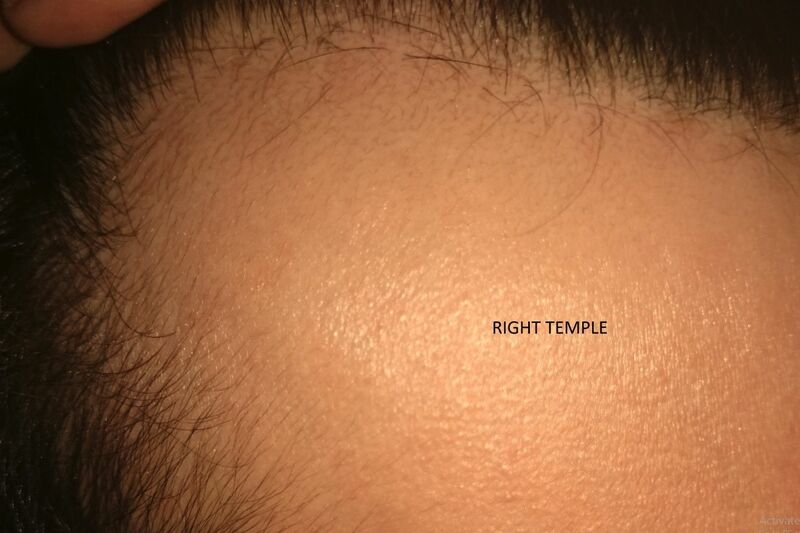 They are now starting to outline the original youthful temple hairline. I do have zoomed back full headshots from before, and video, but they are of not much use yet either. Interestingly the photos from two and a half weeks ago show the perspective distance and lighting to do the comparison with. As with my beard, that amount of time can change a lot. some of these are the same photo vertically and sideways. The camera takes the raw photo sideways, but vertical frame shows the old hairline better. Honestly even to me the amount of thick hairs and lengthening in such a short amount of time is interesting. I am doing my best to document it so it can be clear and we can all see what the results are. I was reading a colostrum post by Delphine and I want to repost his link as something relevant. Basically it is from hair transplant surgeons and they are talking about why hair regrows. I have grafts and they grow well after being sliced, diced, thrown on ice for hours, then poked into a new gouged out scalp area. You would expect them to be weak from scarring, damaged capillaries, and then planted in a degraded scalp area. Somehow the surgery does not reduce the ability to grow. The blood flow is restored and the hair retains it's ability to grow normally. My point is similar to a previous post about why a healing response to micro bruising with strong pressure may work. Any injury causes the body to send repair platelets via the blood. With these platelets are growth factors that promote hair growth, stem cell repairs of tissue, and new capillary growth (also based on previous post links). The process of daily pressing or needling I believe has a similar effect as plasma enriched treatments to regrow hair. According to The International Society of Hair Restoration Surgery website, “Investigators have reported that platelet-rich plasma promotes hair growth from follicles by the action of platelet growth factors on hair follicle stem cells.” Platelet-rich plasma, when used in hair restoration, is administered by a professional in that field. The platelets are derived from the patient's blood. According to the Center for Nutritional Research website, platelet-rich plasma biochemical mechanisms are found in bovine colostrum. 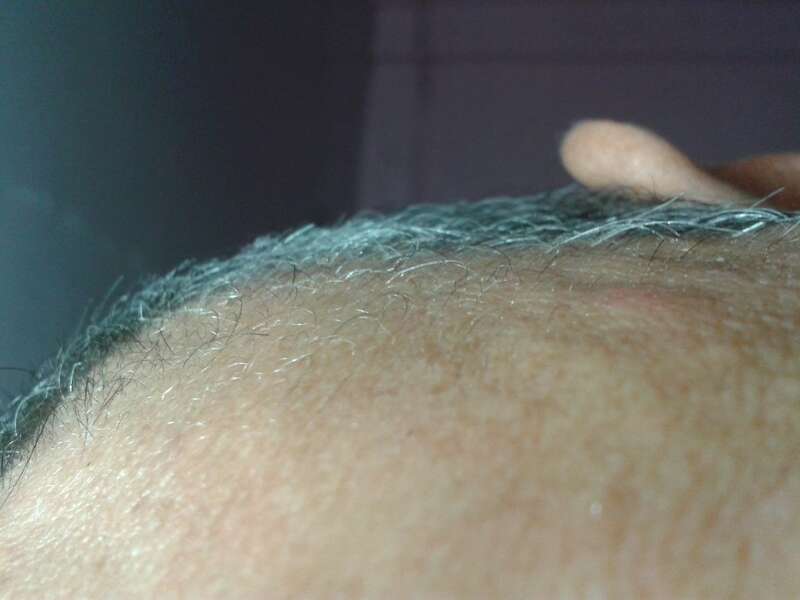 I will again borrow a link from another current thread to investigate first the blood supply to the hair follicle, and second the possible source of the sore areas on the scalp. First let me say that I am not in full agreement with the conclusions and measurements of the complete ideas being presented in the linked pages. I am using the links for selective anatomical diagrams of relevance, although some of the surrounding text is interesting . 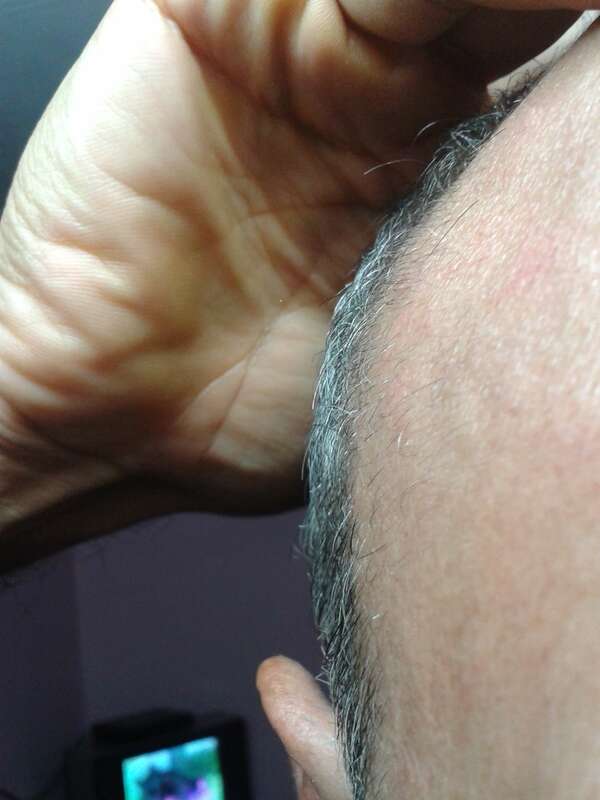 This is a picture of the major veins that supply the hair and scalp. Obviously the farther the hair is from these veins the more possible they are not properly nourished or may fall out. The contextual presented idea is that the scalp stretches as we mature and reduces blood flow with people that have a more domed shaped head. Either way, I think it is possible that many follicles could be not getting enough blood circulation. My own regrowth started directly over my veins that bulge with massage. "Now, from the diagram , you can see that only a single capillary serves each hair root. And, because each capillary is just one cell wide, blood can only supply each hair root one cell at a time." 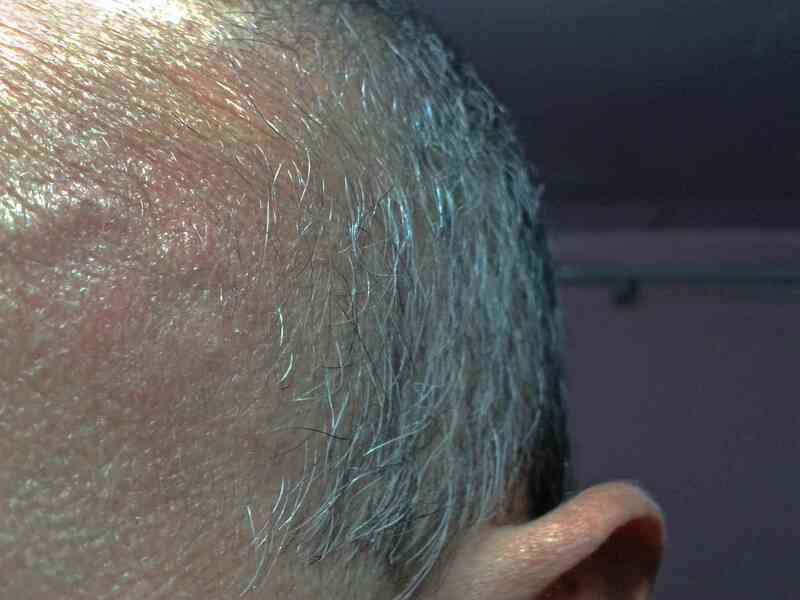 "So, from this low blood flow rate through each capillary, together with the relatively high demand for nutrients by hair follicles, you can appreciate how scalp hair growth could easily begin to suffer should there be any interruption in the blood supply. " 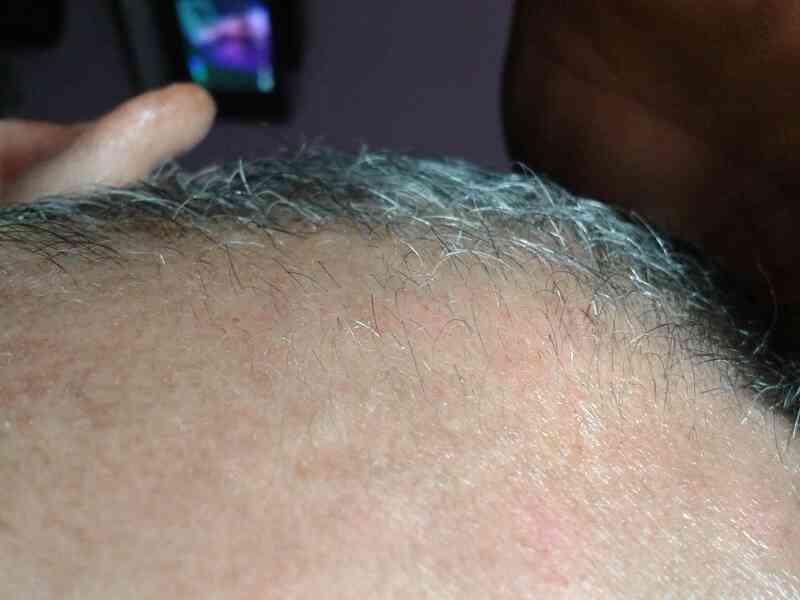 "Hair growth (scalp) is very rapid – faster than any other part of the body except bone marrow. And there’s also a greater density of hair on the scalp than anywhere else on the body. So, clearly scalp hair needs a regular supply of nutrients if it is to grow well. " It is pretty clear to me from the diagrams and super thin capillaries that feed the follicle that there could be many reasons for reduced blood flow. Anything from cholesterol, low blood pressure, calcification, etc. could block a path/vein one cell in width. Please update us if you know any of this anatomy to be inaccurate. 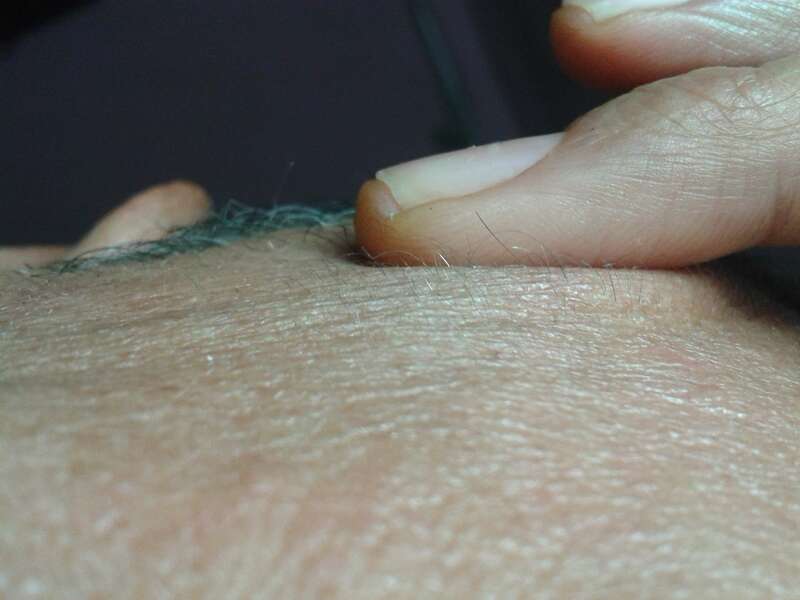 As I have mentioned before, the reason for the deep pressure is to reach the lower skin layers where the vein enters the bottom if the follicle. This is the advantage of deep pressure massage over needling to regenerate and supply more fresh blood and nutrients. In the next post I will continue with the bones and calcification. Now a bit about the idea that the bones in the skull. The bones are divided by cracks and that areas of the scalp grow to make our heads bigger as we age. I will be sourcing images from a related link. This got me again wondering if the pain felt with pressure on the scalp could be calcium crystals needing to be broken up and dissolved. 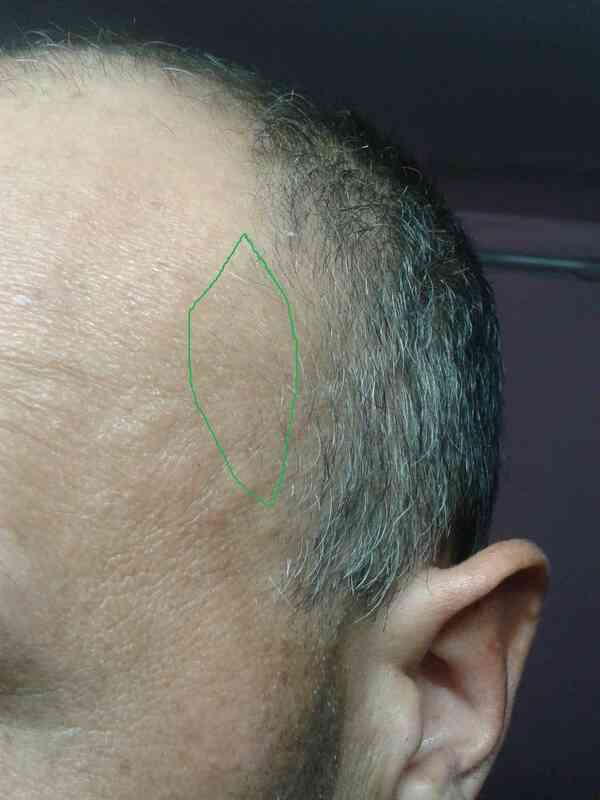 The scalp skin is very close to an area of bone growth. If the crystals are in the tissue, blood capillaries or excess on the scull ridges; either would be a fine explanation for the gout like pain when pressed. My sore areas did correspond with the bone growth areas. In my very first posts I described my technique as skull grating pressure in small circles. For me the effect of reducing the cause of the soreness leads to regrowth. Nice to have science to support theories and refine the process. Do you think that regular scalp acupuncture could be a possible cure since it brings bloos and nutrients to the area? lookalike wrote: Do you think that regular scalp acupuncture could be a possible cure since it brings blood and nutrients to the area? I do not have enough experience with acupuncture to say. 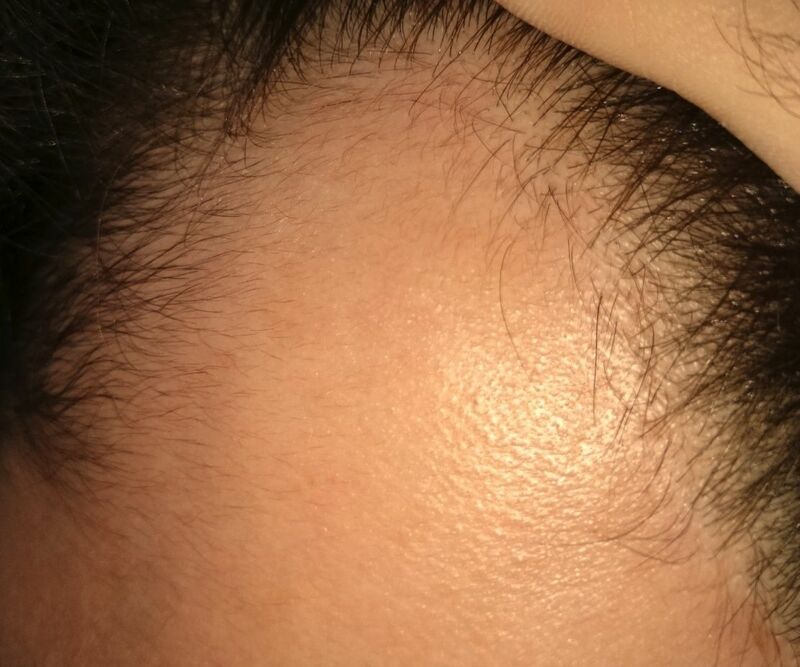 I have done a few months of freehand syringe needing with minoxidil across the surface of my scalp. Like demarolling it is useful and similar, but I did not see the follow through regrowth. I did see the response of some (like 5) of the unusual full diameter hairs just start growing in random places across the scalp. Also some lengthening of some borderline hairs. With DT-CPR it seems like all of the hairs are stimulated to lengthen. Needling should not be done every day, the coverage is spotty, and the effected area is not as deep or to the skull. Cinnamon oil gives a quick surface blood rush with no apparent complications. Hey Cdto2012 I just went through that link you posted, that guy seems to make some really good points. Too bad his e-book isn't a bit cheaper I probably would have bought it. skull expansion ,maliniak methode ,detumescence they all go in a same direction when it come to the hair loss ,they all explaine your hair loss cause is all about blood cerculation ..DHT accumulated after blood restrected (low oxogen level)..researchers found alot of DHT onley in the bald regeon so they think they found the creminal and they going to attack hem hard with drugs ..but still have fullecls not feed enough no matter what drug we use ..so hair loss continue. check detumescence again it not only about scalp massage it is also a bone massage ..it is hard to believe that bone can be resized but i think it is posible ..it may take months , year ? but if that guy or henry choy team did it then we can . I think all these methods WORK. The key is providing sustainable and adequate blood flow to the scalp through synergistic methods. Everybody's body is different; some may react favorably well with dermarolling; others with bristle boar brushing; others with DT. This is why it's imperative to try various strategies to better gauge your body's response level. It's a trial and error experiment and it took me 3 full arduous months to figure this out on my OWN. That being said, I finally hit my 8 month mark. I have been on and off DT the last few months, but I did incorporate a major change in my regimen - massaging my WHOLE scalp since I hit the 6 1/2 month mark. I think the one BIG takeaway from the DT study is to massage the WHOLE scalp because DT is a holistic technique. Our body and the formation of our arteries are complex and so intertwined that if we sacrifice a particular area on our scalp, our action might prolong the recovery period. 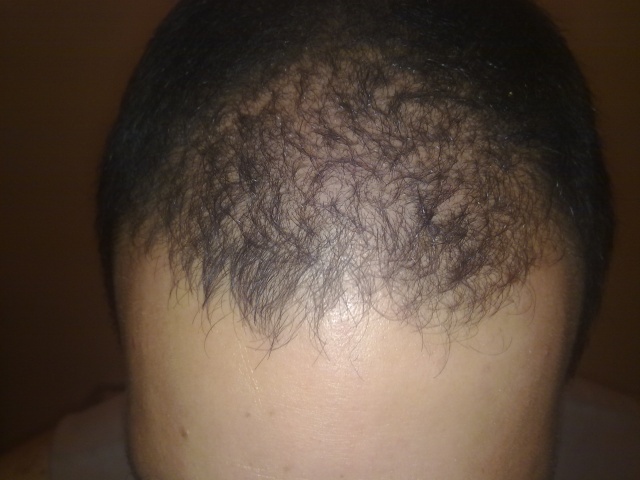 To give you tangible proof, my frontal region has remained stagnant since I started losing hair at age 24 (I am now 28). Even worse, this area has not improved even marginally with DT, dermarolling, bristle boar brushing, inversion therapy, laser therapy etc. for about 7 months or so before I started massaging my WHOLE scalp. Since the incorporation of this major change for about 2 months now, my frontal region is beginning to show much thickness than before. I think it's fair to say this new strategy has definitely improved my overall hair appearance. Who knows what the results would have looked like at the 8 month mark if I was continuing with my old regimen. Either way, it does not hurt to try. Better to do DT the right way than to waist your time doing it the short way like I did in the beginning. I hope this is a good food for thought for those thinking of or are currently performing DT. long hair wrote: skull expansion ,maliniak methode ,detumescence they all go in a same direction when it come to the hair loss ,they all explaine your hair loss cause is all about blood cerculation ..DHT accumulated after blood restrected (low oxogen level)..researchers found alot of DHT onley in the bald regeon so they think they found the creminal and they going to attack hem hard with drugs ..but still have fullecls not feed enough no matter what drug we use ..so hair loss continue. Well, there is no "Henry Choy". It's a fake study. That said, I'm interested in Rei Ogawa's research. I have never commented much on the Choy study, it seemed a bit thin in documentation to me also. There must have been hundreds of photos that could have been released. I am not a big fan of domed head shape taking all of the blame for MPB either. It kind of reminds me of historically when they would determine intelligence by measuring head size.